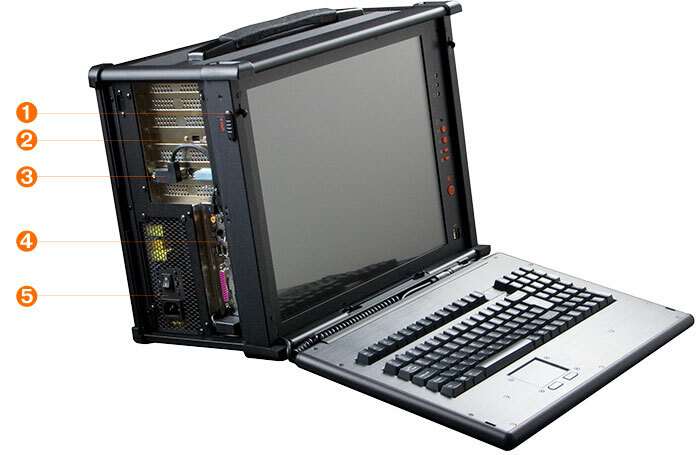 MPC-9000 rugged portable workstation is housed in an anodized alumium alloy chassis. A multi-core processor motherboard provide PC workstation performance. 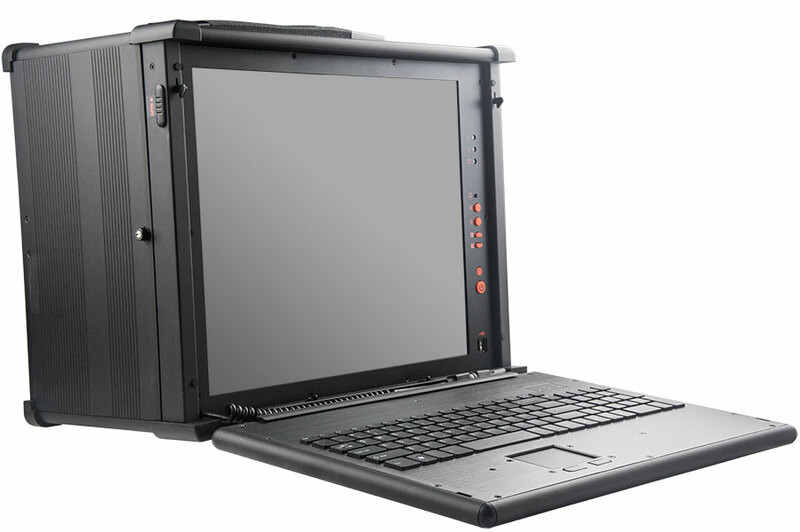 The MPC-9000 is a compact, self-contained portable computer ruggedized for mobile computing applications in harsh environemnts. The lunch box style enclosure is constructed of anodized aluminum alloy. Corner rubber bumpers add to its protection against bumps and shock. The MPC-9000 supports commercial off-the-shelf PC components. You can select from a wide array of processors and components to assemble a system that meets your needs today, and still have room for expansion and upgrades tomorrow. The MPC-9000 supports industry standard motherboards—ATX, Micro-ATX and Mini-ITX form factors. This means the latest PC desktop and workstation technologies are readily available. 2. Expansion slots—up to seven slots. 3. Internal video cable attached to video card output port. 1. A slim type optical disk drive. 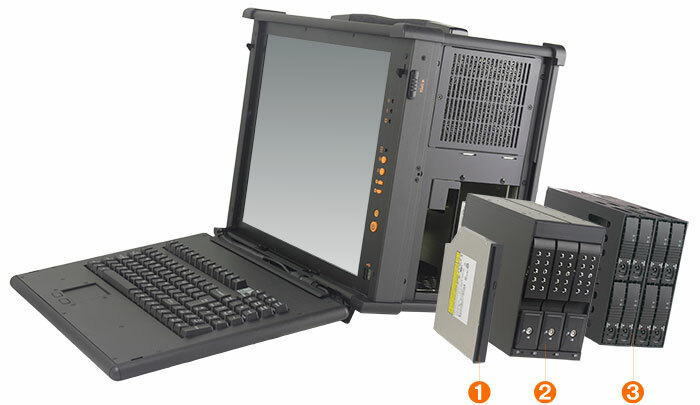 3. one or two removable 2.5" hard drive mobile racks that support four disk drives each in the 5.25" drive bays. Two internal drive bays suppot two more 3.5" hard drives. MPC-9000 comes with a soft transport case with wheels and telescopic handle. 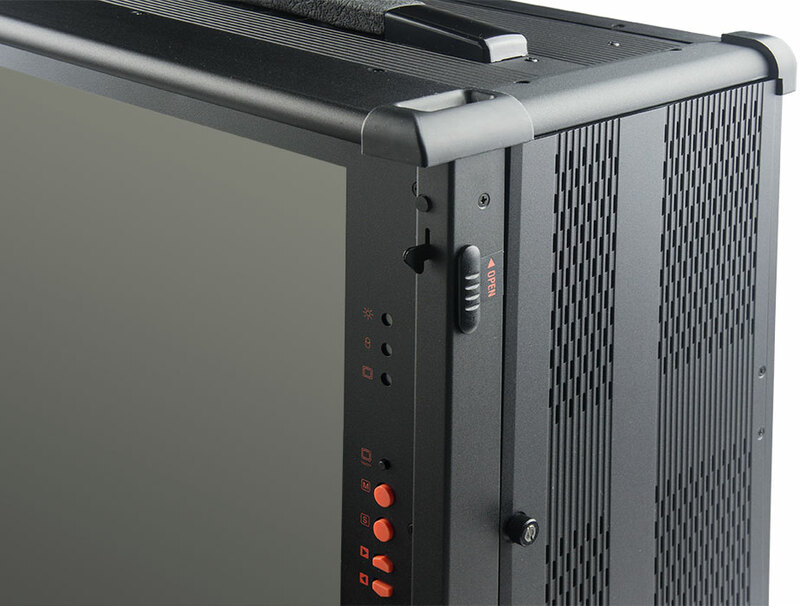 Portable system chassis constructed of aluminum alloy. Hard anodizing surface: MIL-A-8625E Type II/III. 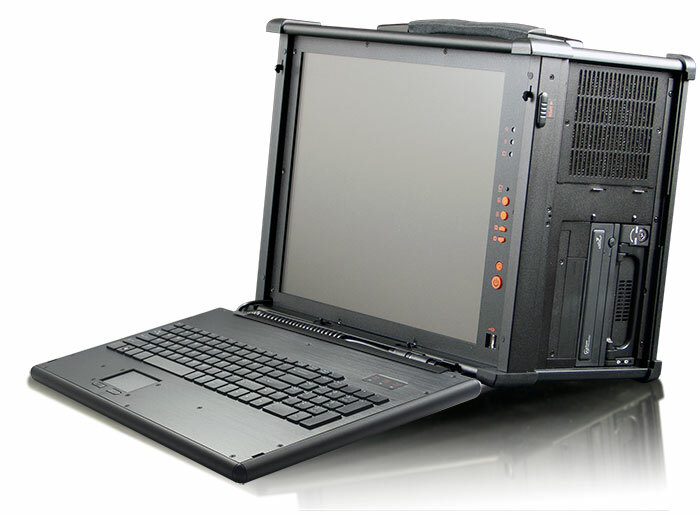 Integrated flat panel display and fold-down keyboard. 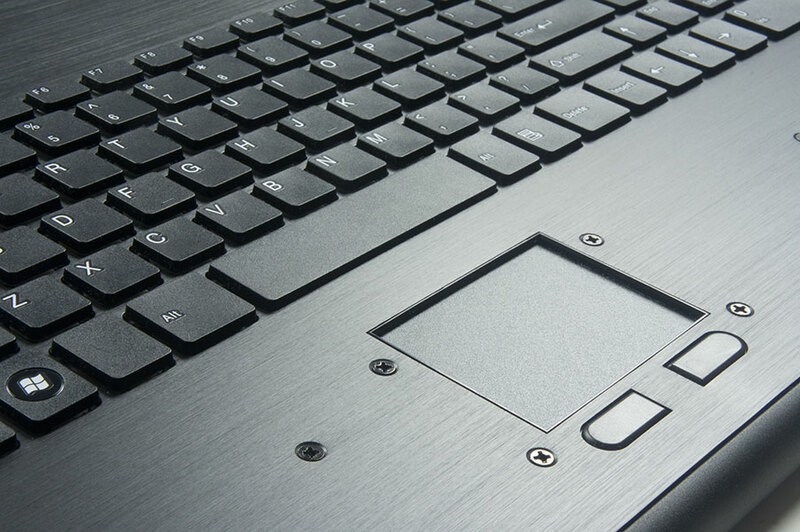 Detachable keyboard with integrated touchpad pointing device. Two 12 cm cooling fans. 17" LCD, 1280 x 1024 resolution. Two internal 3.5" drive bays. One slim optical disk drive bay. Enclosure dimensions: 17.2" (W) x 13.4" (H) x 9.3" (D). System weight: approximately 35 lbs. with a fully configured system. Transport case measures 25” x 20” x 14”. Shipping carton dimensions: 26.5" (L) x 17" (W) x 22" (H). 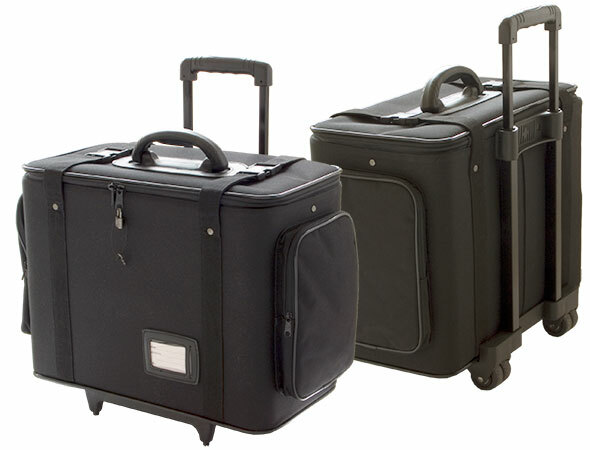 Shipping weight (includes transport case): approximately 58 lbs for a fully configured system. Input: AC 100 ~ 240 V, 50 ~ 60 Hz, full range (PFC). Output: 650 watt power supply standard; upgrades available. Temperature: Operating—0~50 °C (32~122 °F); non-operating— -20~60 °C (-4~140 °F). Humidity: 5~95% @ 40 °C, non-condensing. Altitude: Operating—15000 ft. Non-operating—40000 ft. Shock: Operating—half-sine wave @ 15 G, 11 ms duration on ±x, ±y, ±z directions, 3 times per face, @ 20°C, 65% RH. Non-operating—half-sine wave @ 50 G, 11 ms duration on ±x, ±y, ±z directions, 3 times per face, @ 20°C, 65% RH. Vibration: Operating—20-60 HZ, 0.075 mm sine wave sweep in XYZ directions for 0.5 hrs @ 20°C, 60% RH. Non-operating—10-50 Hz, 0.15 mm sine wave sweep in XYZ directions for 0.5 hrs. @ 20°C, 60% RH. 17" LCD monitor, 1280x1024 resolution. Intel C246 chipset LGA 1151 motherboard. Intel Xeon E-2124G Coffee Lake 3.40 GHz processor. Processor integrated Intel UHD Graphics P630. 8x SATA3 6.0 Gb/s connectors (shared lanes with M.2). One slim-type DVD +/- RW optical disk drive. Realtek ALC1220, 7.1 channels audio. 1x DVI port (used to drive MPC-9000 LCD). 1x VGA port (max resolution 1920 x 1200@60 Hz). 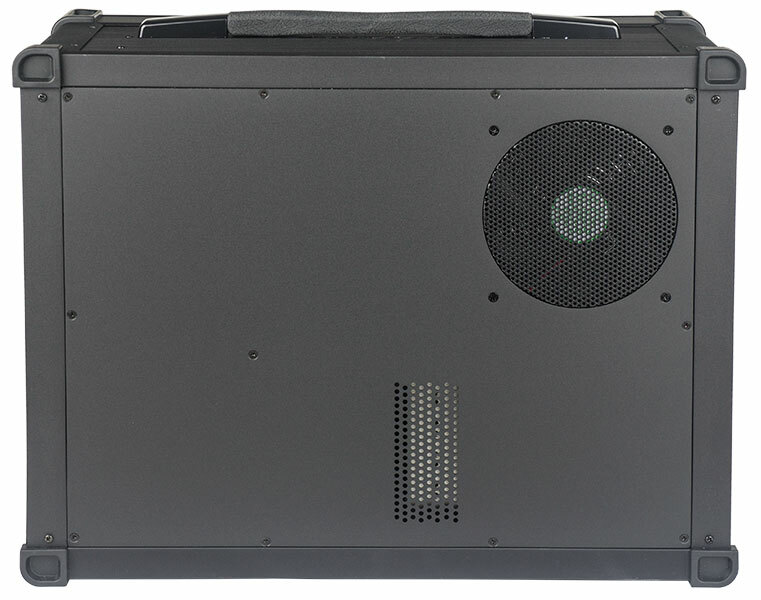 1x HDMI port (max resolution 4096 x 2160@24 Hz). 1x DisplayPort (max resolution 4096 x 2304@60 Hz). 1x USB 3.1 Type-A Gen2 port (10 Gb/s). 1x USB 3.1 Type-C Gen2 port (10 Gb/s). 8-channel audio I/O ports (5+1 audio jacks). 1x PCI-E x16 slot, x16 / x8 Gen3 Link. 1x PCI-E x16 slot, x8 Gen3 Link. 1x PCI-E x16 slot, x4 Gen3 Link. 1x PCI-E x16 slot, x4 Gen1 Link, shared with 4 SATA. 2x PCI-E 3.0 x1 Gen2 Link. Microsoft® Windows® 10 Professional, 64-bit installed. Intel Z390 chipset LGA 1151 motherboard. Intel Core i7-8700 Coffe Lake 3.2GHz 6-core processor. 16GB dual channel DDR4 DRAM installed, up to 64GB. NVidia GTX-1050 Ti 4GB graphics card. Bluetooth 4.0 / 3.0 +high speed class II. 10x SATA3 6.0 Gb/s connectors (shared lanes with M.2). 2x SATA Express 10Gb/s connectors. 3x Ultra M.2 socket, supports type 2242/2260/2280 M.2 SATA3 6.0 Gb/s module and M.2 PCI Express module up to Gen3 x4 (32 Gb/s). Realtek ALC1220 7.1 channels audio. 1x Optical SPDIF Out port. 3x USB 3.1 Type-A Gen2 port (10 Gb/s). HD Audio Jacks: rear speaker, central, bass, line in, front speaker, microphone. 1 x Vertical M.2 Socket (Key E) with the bundled Wi-Fi 802.11 ac module. Intel X99 chipset LGA 2011-3 motherboard. Intel® Xeon E5-2620 V4 eight-core processor. 32GB quad channel DDR4 DRAM installed, up to 256GB. 1x SATA Express 10Gb/s Connector (shared with SATA3_4 and SATA3_5). 1x Ultra M.2 Socket (M2_2), support type 2230/2242/2260/2280/22110 M.2 SATA3 6.0Gb/s module and M.2 PCI Express module up to Gen3 x4 (32Gb/s). 1x Ultra M.2 Socket (M2_1), support type 2230/2242/2260/2280 M.2 SATA3 6.0Gb/s module and M.2 PCI Express module up to Gen3 x4 (32Gb/s). Realtek ALC1150 7.1 channels audio. 1x USB 3.1 Type-A port (10 Gb/s). 1x USB 3.1 Type-C port (10 Gb/s). 3x PCI Express 3.0 x16 Slots (supports NVMe SSD as boot disk). 1x vertical M.2 socket (Key E), supports type 2230 WiFi/BT module (the M.2 socket does not support SATA M.2 SSDs). Microsoft® Windows® 7/10 Professional, 64-bit installed. MPC-9000 keyboard and touchpad. Full size keyboard with low-profile, low-travel, flat keycaps keys (chiclet style). Download MPC-9000 mechanical drawings ↓. Use this form to select your desired components for your MPC-1700 portable workstation. Please choose a base configuration first. You may modify the system configuration using available options. If the options don't address all of your requirements, please use the message field of the form to ask for options not available here. Other multi-core processor (use the comments area to specify). More than 64GB memory...see my choice in message. Other hard drives...see my choices in message. Blu-ray read only, DVD read/write optical drive. I don't need an optical drive. Must have at least one 64-bit PCI slot. Must have at least one 32-bit PCI slot. Must have at least two PCI-express x16 slots. Other slots...see my choices in message. Other controller...see my choices in message. I will install my own operating system. Microsoft Windows 7 Professional 64-bit. Other OS...see my choice in message. This is a build-to-order system and usually takes 10 business days to ship after we receive your order.